Do you remember Duck Tales? If you do, I bet you’ve got the theme tune in your brain right now. And it will stay there for a significant amount of time. Sorry. But the most important thing about Duck Tales was Scrooge McDuck. When he dived into that bath of gold coins. Because that’s what life is like for you right now. 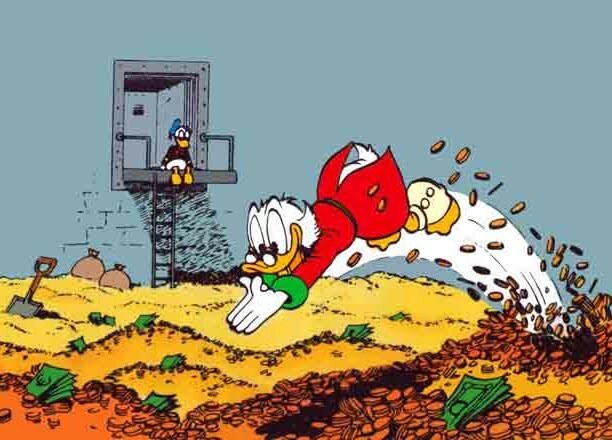 You’re giving it the full Scrooge McDuck, bathing in gold, because business is so amazing and you’ve got clients coming out of your ears. It’s getting to the point that these pesky clients are impinging on your lifestyle. What you really need is to put a stop to your sales process. Well, don’t worry … I know just how to do it. Let’s say you go to a networking event. Everyone stands up, does a quick piece to introduce themselves and you all pair off, for your one-to-ones. Wait till they expose their weakness … something like “and that doesn’t work right”, or “we are looking for a better way”. As soon as there’s a chink in their armour, as soon as they’ve revealed that they aren’t living that Scrooge McDuck lifestyle, you need to dive in (just imagine it’s a vault of pure gold). Explain to them how great your service is. Make sure that they are aware of every feature, every tiny option. Pound them over the head with it. Remember, they’ve said that they need help … who better than you to help them? If you move really fast like this, you’re guaranteed to piss your prospect off. You might get some sales from it, but you’re more likely to get people waiting till you’re out of the room and badmouthing you to anyone who’ll listen. However, if you’re not Scrooge McDuck quite yet; if you’re feeling like you really can’t afford to piss people off and lose those potential sales … why not take my quick quiz and see if it’s really sales that you need help with? It might be that actually you could do with generating some more leads, streamlining your operations or just increasing your profitability. Sometimes the smallest changes can make a massive difference – but only if you start from the right place.